Original content and a punt on advertising have led to growth in profit and viewing share. Darren Childs ought to have the seven-year itch. David Abraham at Channel 4 and Adam Crozier at ITV have both announced that they are stepping down after serving as chief executive for seven years. But if Childs is thinking of leaving UKTV, where he has held that role since 2010, he isn’t giving any clues. "Have I got a seven-year itch?" he says in UKTV’s Hammersmith office, staring out of the window to ponder the question. "I’ve never not had a fantastic day in this place." It is exhilarating "building a challenger brand in high-growth mode", he says, noting that UKTV has doubled revenues in the past seven years and now has a 300-strong team that has almost doubled in size too. "Long may it continue," he beams. The fact that he has been touted as a contender for the ITV and Channel 4 vacancies says a lot about Childs’ tenure at UKTV, where he has steadily increased profits and share of viewing for his owners, BBC Worldwide and Scripps Networks Interactive. "The ability to monetise ad insertion in VoD will separate the winners and losers in this business"
The most recent results for 2016 set new records with operating profit of £91.3m and revenues of £344.8m. UKTV has an almost 10% share of commercial impacts, up from 7% in 2010. It has overtaken the Channel 5 and Sky portfolios and is closing in on ITV’s digital channels. "UKTV’s business has been on a massive pivot," Childs, who was born in Doncaster and holds an MBA from Stanford University, says. When he took over from Abraham, UKTV relied heavily on archive BBC shows and the majority of its revenues came from carriage fees. Now, the owner of ten channels including Dave, Drama and W invests in and commissions more original shows such as Taskmaster, Dynamo: Magician Impossible and Dave Gorman: Modern Life is Goodish, which have driven audiences. Advertising, handled by Channel 4’s sales house, generates about 70% of UKTV’s revenues. The three years before the Brexit vote in June 2016, in particular, were a golden period for TV as advertisers sought broadcast reach. But it still seems counterintuitive for Childs to have increased dependence on advertising in the age of Netflix and ad-skipping. "If you see creativity as a critical component, you want it close to you – we want it in the building because it brings energy"
"What we’ve been doing is travelling along the same road but in a different direction," Childs says, pointing out that UKTV is balancing ad and pay revenues like other broadcasters. "There’s a ton of headroom for growth." Childs has signed new, enhanced deals with both Channel 4 for ad sales and Sky for carriage in the past few months, although he is cautious about the economic fallout from Brexit. UKTV’s increased share of viewing gave him a strong bargaining position, especially for video-on-demand, which is where he sees the big opportunity. The Channel 4 deal, which is estimated to be worth as much as £2bn over ten years, took eight months to negotiate. "We understand the value of our inventory and our airtime and our brands much better than seven years ago," Childs says. Meanwhile, the carriage agreement with Sky includes dynamic ad insertion for VoD service UKTV Play on the pay-TV platform. The deal does not include AdSmart, Sky’s ad-targeting offering, but Childs believes the general shift towards addressable advertising bodes well for broadcasters as they compete against the internet giants. "From an advertising perspective, we have to be broadcasters but we also have to be narrowcasters," Childs explains. "People love TV. People love long-form content. But our industry has to get smarter in serving agencies’ and clients’ needs for more targeted advertising." That is why he says the business is now "totally focused on VoD", particularly when live viewing now represents barely 40% of time spent watching video by 16- to 24-year-olds. "The ability to monetise ad insertion in VoD will separate the winners and losers in this business," Childs claims. Childs admits he leaves most of the day-to-day dealings with agencies to Channel 4 but does talk to brands as advertiser-funded programming is on the rise. Storytelling series Crackanory was an original commission that is now funded by Amazon’s Audible. Critics say UKTV’s original commissions are middle-of-the-road compared with Channel 4. "I do think we take risks," Childs counters, pointing to science series Dara O’Briain’s Go 8 Bit and live coverage of the Tie Break Tens tennis tournament. UKTV’s financial return from increasing investment in programming has given Childs confidence to invest in its own brand. Earlier this year, UKTV said that it would no longer retain an ad agency and would expand its in-house division, UKTV Creative, which now employs about 40 people. Childs says: "If you see creativity as a critical component, you want it close to you – we want it in the building because it brings energy." A redundant "half-floor" on a mezzanine level of UKTV’s office has been transformed into edit suites and filming studios. Half-a-dozen staff from production house The Farm Group work there permanently on trailers and promos. Creating a culture of creative and entrepreneurial risk-taking is important to Childs, who enthuses about his recent trip to TED2017 in Canada. "Yes, we’re a TV company," he says, but he likes to think bigger. "We’re a brand media business – a consumer business." That’s part of the reason why there are no TV sets on the walls in the open-plan office, he says. Childs is also proud of UKTV’s "rigorous" hiring policy that requires five interviews and generally takes three months. Nearly 20% of staff are from a black or ethnic-minority background and 55% are female. "That’s why there are no visible signs of hierarchy – all I care about is great work," he says. There has been talk over the years about Scripps trying to buy out BBC Worldwide’s share of UKTV and ITV looking at making a bid. Childs’ view is that a sale is a matter for shareholders, not him. 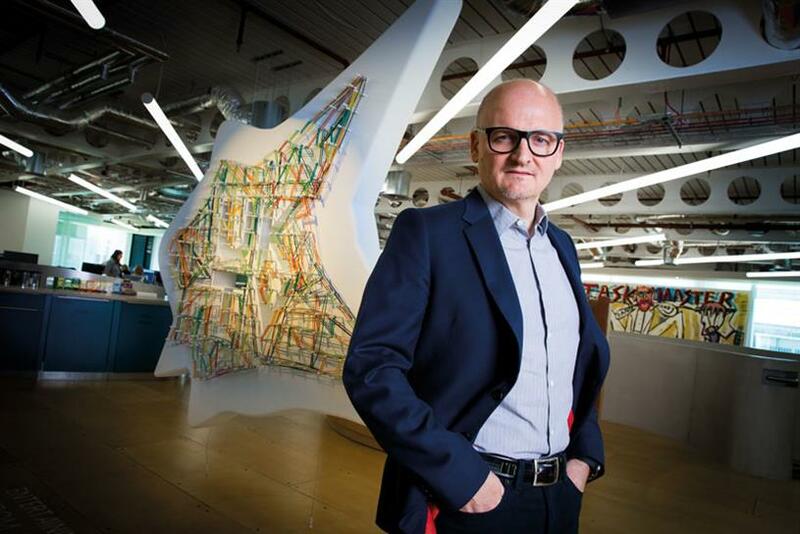 Tim Davie, chief executive of BBC Worldwide, says: "As a leader, Darren is incredibly good at navigating the complexities of a number of stakeholders while keeping UKTV motivated, creative and delivering growth." The City rates him. Paul Richards of Numis Securities says: "Childs inherited a business in good shape and has executed well. A key challenge for UKTV will be keeping hold of him given the current vacancies in broadcasting." Childs has had a varied career, including spells at MTV and Star TV in Asia, Sony Pictures in EMEA and BBC Worldwide’s global channels. He believes demand for great TV will never go out of fashion with viewers or advertisers. "With all the new technology that is going into ad-serving and the platforms used to distribute it, we think this business has a really good future," Childs says.